Siemens has been building railcars for over 160 years, yet the level of technology innovation they employ is on par with the latest high-tech manufacturing companies. Sacramento is fortunate to be home to 850 Siemens employees, including more than100 engineers who are finding new ways to improve safety, reduce weight and achieve mind-blowing energy efficiency. This week CMTA got a glimpse of Siemens’ Sacramento operation. 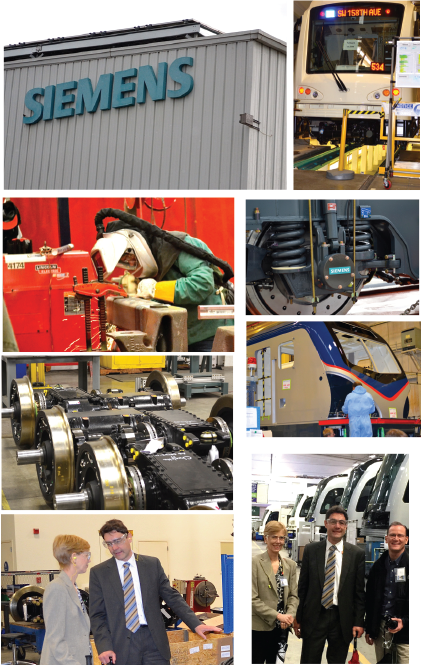 Everything we saw -- from precision welding of parts for the undercarriage to survive 30 years of operation to final touches on interior spaces for the comfort of passengers -- confirmed the company’s commitment to be an industry leader. We particularly enjoyed seeing the latest generation light rail cars to be delivered to Charlotte, Portland, San Diego and Calgary. Soon the plant will begin to build the next edition light rail cars for the San Francisco Muni and this year will also be the production start of the trains for All Aboard Florida – a new passenger service connecting Miami and Orlando. We were also pleased to learn that “Made in America” is a major goal for Siemens production. That means many types of jobs are required in the facility and suppliers across the country benefit greatly from Siemens operation here. The company was also one of the first major manufacturing facilities to power its operations with solar power — 85 percent of the plant is powered by the sun. Since Siemens chose Sacramento as a major headquarters in 1984, it has provided hundreds of upwardly mobile jobs to support a middle class or better lifestyle for California families. The good news is that the future for Siemens and other rail industry suppliers remains bright, as population growth and the need to reduce vehicle miles traveled to meet the state’s greenhouse gas reduction goals will put more rail options on the table for consideration. Passengers on Siemens railcars will get where they need to go in energy-efficient style, not wasting time on congested streets and freeways or in clogged airports. When it comes to high-speed rail, Siemens has a great track record. They have more than 400 high-speed trainsets in operation globally that have traveled more than 600 million miles to date. And, the mileage for the fleet is growing by over 300,000 miles each day, experience that proves their leadership and innovation in the field. Siemens exemplifies what it means to be a California manufacturer – providing great value to customers through innovation and the contribution of highly skilled and productive workers able to meet all business and technical challenges. We look forward to another visit with Siemens as they continue to grow and prosper in the state.